Yes, it was a proud tradition. A proud tradition of…something. But, to be honest, I probably wouldn’t have known that without the helpful sign. 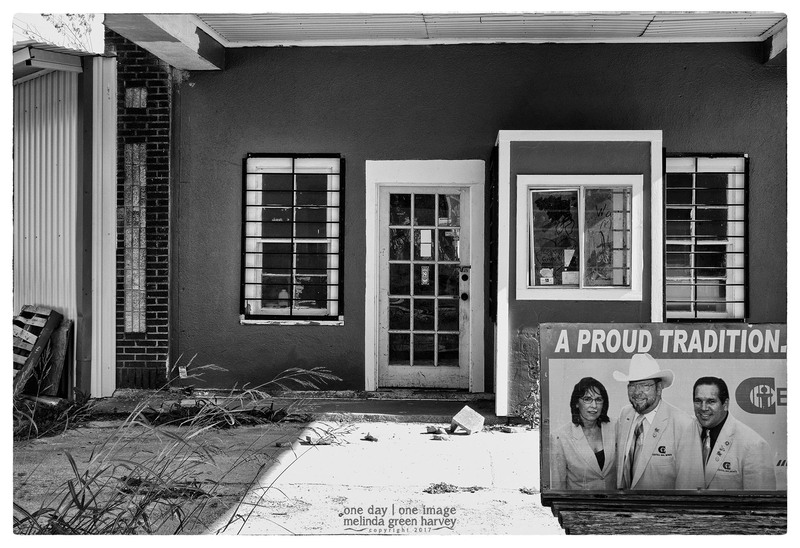 Posted on January 7, 2017, in Photography and tagged 365 photo project, 365 project, abandoned buildings, black and white photography, Leica, one day one image, photo a day, postaday, Ranger, Ranger Texas, signage, texas. Bookmark the permalink. 6 Comments. Here’s something else to think about: just out of the frame on the left side, there was a toilet. Rectangle heaven. I like how the tilted window frame asserts itself, even though a minor detail. How often is it the case in photos that a minor detail is what really pulls it all together? And the thing is that window frames are so rarely assertive! I wonder how come this one felt compelled to buck the trend? It sensed your presence and just let loose with an assertion. I can’t decide if that’s wonderful, or if it’s really, really creepy….